This bluegrass banjo was created upon request of David Fields of Midland, Texas. It features a continous vine of mother of pearl with flowers of colorful abalone running the entire length of the fingerboard and bound peghead. The colorful flowers are in the marked frets positions and the pearl leaves are engraved. The same design of flowers and vine are carried through to all the metal engraving which is all chased (cut) rather than the zig-zag "wriggle" engraving so prevelent. 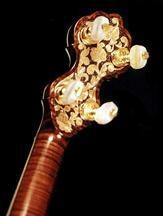 The tuning pegs are engraved to match with real mother of pearl buttons. All metal parts are gold plated. The neck and resonator are made of tigertail maple and stained dark around the carving. The neck is carved on the back of the peghead and heel with the same floral pattern as on the fingerboard. The resonator is carved around the sides and on the back. How does it sound? This banjo sounds as good as it looks. With a uniquely shaped three-ply hardrock maple rim and a mastertone shaped solid ebony patented tonering, this banjo really pops with a full deep tone which is uniquely bright. It has ample horsepower so you don't have to pick hard in a large group. Photos available. Price is $18,000.